The Coventry Market Hall was built in the 1860s, complete with a clock tower. It became the beating heart of the city until its destruction in 1940. Here is a potted history of its story. A film is in the making that will tell the story of this lost gem. The ‘old’ Market Hall was a relatively small structure situated to the West of Broadgate, between West Orchards and Smithford Street. It was known by some as Solomon’s Temple – apparently named after one of the custodians of the Market building. 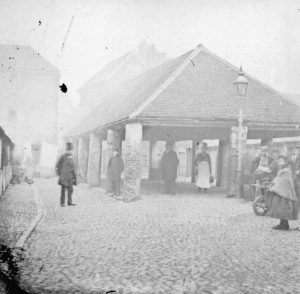 However important this market building was, the main market was the open air market in Broadgate. Land on Hollyhead Road sold off by the Corporation to fund the New Market Hall. The Corporation reports the cost is between £5,000 – £10,000 for the buildings, about £6,000 for the land but that excludes the property already owned by the Corporation. The Clerk then reports a figure of £25,000 to £30,000 for the whole project. (Sounds like he was making it up on the spot!). Designs! An exhibition at St Mary’s Hall of several designs, each comprising of 7-8 drawings. They were all well received by the Corporation and the people of Coventry. However, the winning design was modified by the Corporation to allow for a Crystal Palace style roof from the second best design. 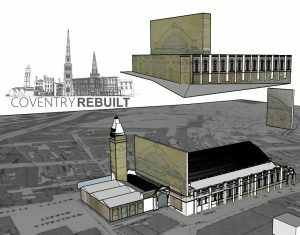 The site chosen will remove a number of old buildings that a strange to the city would hardly believe could exist in the centre of a respectable old place like Coventry. The primary entrance to the Market Hall will be from West Orchards that will include a row of high quality shops. The second entrance will be via Market Street. The entrance from Broadgate will be widened with the removal of the City Arms Inn. In all, this will be a marked improvement and benefit to public sanitation. The ornamental tower, adapted from the fixing of a clock was taken from the winning design was not to be erected immediately due to cost. It may however be added with advantage at a future period when the town is more prosperous. It has been proposed that a time ball might be added to its extreme summit instead of the customary wind vane – the watch makers of the city would see this as a great advantage to be in immediate communication with Greenwich. A suggestion of a ceremony and dinner to mark the laying of the foundation stone was put forward. The motion was not carried and so, never too place. Contract awarded to Mr W Tomlinson of Coundon – Between 1865 and 1867 the demolition of and building work takes place. 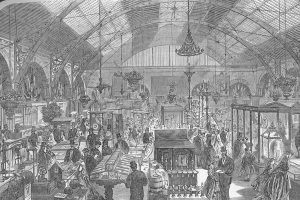 The Coventry and Midland Manufacturing Industrial and Art Exhibition – opened to the public on Wednesday 19th June 1867 by the Right Honourable Lord Leigh, Lord Lieutenant of Warwickshire, the Right Honourable the Earl of Clarendon, K.G. James Marriott, Esq Mayor of Coventry, the Right Rev. the Lord Bishop of Worcester, the Right Honourable Lord Lyttelton, Lord Lieutenant of Worcester, the Right Honourable the Earl of Aylesford, the Right Honourable Earl Howe, the Mayors of Tamworth, Lichfield, Nottingham, Derby and Stratford, Captain Adams, Rev. J.H.Iles (Wolverhampton), Rev. R.H. Baynes (Coventry), Rev. S.H Wilddrington, Rev. Dr Temple, Rev. A.W. Wilson (Coventry), Rev. E.E. Delf (Coventry). Local Societies & Associations are invited to take part in a procession on the opening day. Notice to exhibitors – no goods will be received after 10th June. Season tickets (including admission on the opening day) will be ready on and after Monday next. They will be on sale at the Herald Office & Corn Exchange – Adults 15s, Children 7s 6d. Two enormous lumps of Coal from Wyken Colliery – each weighing up to two Tons will be standing against the exits. Interesting displays of natural products of minerals and fossils. A quantity of old armour and guns from Coombe Abbey. 300 Pictures on loan from the Earl of Craven, Earl of Dudley, Earl of Warwick, Lord Leigh, Mr Bromley MP, Mr Wise MP and some treaures from Dr Dewes and Mr Gulson. Rev J W Leigh has provided a selection of water colour drawings. Mr Eaton MP specimens of Alhambra decoration taken from the Alhambra Palace. Ancient Corporation records will be arranged in cases down the centre. Valuable assortment of antiquities from Lichfield museum will be on display. Every Day – the fair fountain will be flowing, pipping Bullfinches & Machinery in Motion, Doors open at 10 o’clock and close at dusk. The Exhibition will be open every Saturday afternoon after 2pm for the WORKING CLASS at six pence each. [It seems sales of tickets weren’t going as planned!] Shilling days – Monday, Tuesdays Wednesdays, Thursdays, Fridays and Saturdays. Half Crown Days – Thursdays. Children Half Price, Season Tickets down to 10s. ‘Everyone should read Mrs Brown’s Trip to the Exhibition at Coventry priced at two pence published by Mr W. Fred of Taunton’. Exhibition Prize Medal – The committee of the Coventry Exhibition hereby offer a prize of £5 for the best design for a medal to be given o the successful exhibitors. Starnurer Howkin – DRUNK and DISORDERLY! in Market Street – The prisoner pleaded guilty and expressed his regret for the offence. The bench discharged him with a fine of 2s 6d in the poor box. The letting of Market Hall Shops and pitches will start at 12 o’clock promptly. The sale of ale, porter, wines or spirits will not be permitted in any part of the market hall. 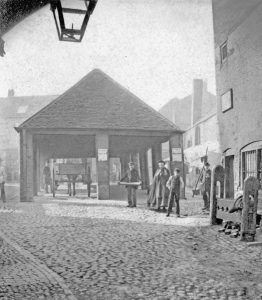 Last Open Air Market in Broadgate – Under the Coventry Market Hall Act 1863 – Any person other than a licensed hawker, who sell’s or exposes for sale in any pace in this city expect his own dwelling place or shop will be liable to be a penalty not exceeding forty shillings. Will come into effect on Monday 2nd December 1867. Market Traders OUTRAGE! They are now paying four times the rents they did in Broadgate. They make a request o the Mayor and Aldermen that they can trade each of the first five evenings of the month until 8 pm with the use of free gas light. Property on Broadgate bought by the Corporation to be demolished to make a wide access to the Market. The roof of the market hall is leaking. The market committee say they have painted it as best they can but can never guarantee that it will never be watertight. Mr Kemp’s celebrated Hal Green Cabbage Plants available at Coventry Market Hall on Friday 21st and the following two Fridays. Orders left at the White horse will be punctually attended to. Tower and Clock finished and opened to the public. Mr E T Loseby won the contract for the clock and was awarded £308 10s but owing to Mr Losbey’s desire to make the clock as perfect as possible, it is believed to have cost him in the region of £600. A clause in the contract – for every second the clock varied over 1 second the winner of the contract would forfeit £1. The clock was to be wound once per week. Billingsgate language that is begin used by the fish stalls is untenable! can anything be done to abate this nuisance? The Coventry Midlands Fancier’s Society – first annual meeting show of pointing and other dogs. Schedule of prizes can be obtained from Mr J W Mills 73 Little Park Street. Entries to be made by 25th May 1879. Post of custodian of the Market Clock – responsible for winding and regulating the clock, salary of £10 per annum. terminable by three months notice on either side. A group of men watched the clock awaiting the electrical signal from Greenwich, so that watches could be compared and if need be rectified. Mr Samuel Corbett of Smithford Street is in charge of the clock – along with many clocks in the Coventry area fro factories and mansions. 85 steps to the clock and a further 30 to the roof where the bell is located which strikes on the hour. The summit of the tower also carries the wires which is connected to the time signal from far below. Four gas gets make the clock face visible which are lite automatically at 6:30pm. The clock tower is 100ft high, diameter 5ft wide, numbers are 91/2 inches, minutes are 1 1/2 inches, minutes 2ft 10 1/2 inches with a breath of swell of 5 inches and hour hand 2ft 1/2 inches long with a breath of swell 5 1/2 inches. The bell is 10 cwt and is struck by two hammers alternatively 25 lbs each with a fall of 5 inches. The weight driving the striking part is 450 lbs and the hand motion weight is 150 lbs. Each of the large weights has a clear feet of 40 feet in eight days. Four boys aged nine to eleven were brought before the magistrates charged with Larceny. Arthur Edgar Longbottom (Aged 10, 6 Bully Yard), Peter Hogan (Aged 10, 17 Greyfriar’s Lane), William Ball (Aged 9, 34 Warwick Lane), Joseph Ball (Aged 9 Greyfriary’s Lane) all scholars of Chyelsmore school. Accused of stealing twenty seven pocket knives, three sets of feeler gauges – the property of Edward Norton an ironmonger who has a stall in the Market Hall. Along with ten shillings worth of chocolate belonging to Thomas Herbert Glenn who also has a stall in the Market. The spikes on the bottom of the arcade were forded away between Thursday evening and Friday morning. The boys all pleaded guilty. The parents of the boys had acted very well and took every precaution to see that their boys told the truth. The boys had hidden the items in a partly demolished house in Greyfriars Lane, where they had been playing. The defendants were bound over the probation of offenders Act to be of good behaviour for twelve months. The Magistrate expressed opinion that the Market Hall should make better protection against small boys!